Just a few months after his 28th birthday, LeBron James is on the brink of his fourth NBA MVP award, joining an elite club of four-time winners restricted to Wilt Chamberlain, Michael Jordan, Kareem Abdul-Jabbar, and Bill Russell. No Kobe. No Shaq. No Duncan. No Magic. No Bird. But since winning his first MVP in 2008-09, LeBron’s game has evolved drastically. He’s a vastly different player now than the one he was in 2011. In fact, each year he’s won the MVP, he’s done so in a distinctive way. 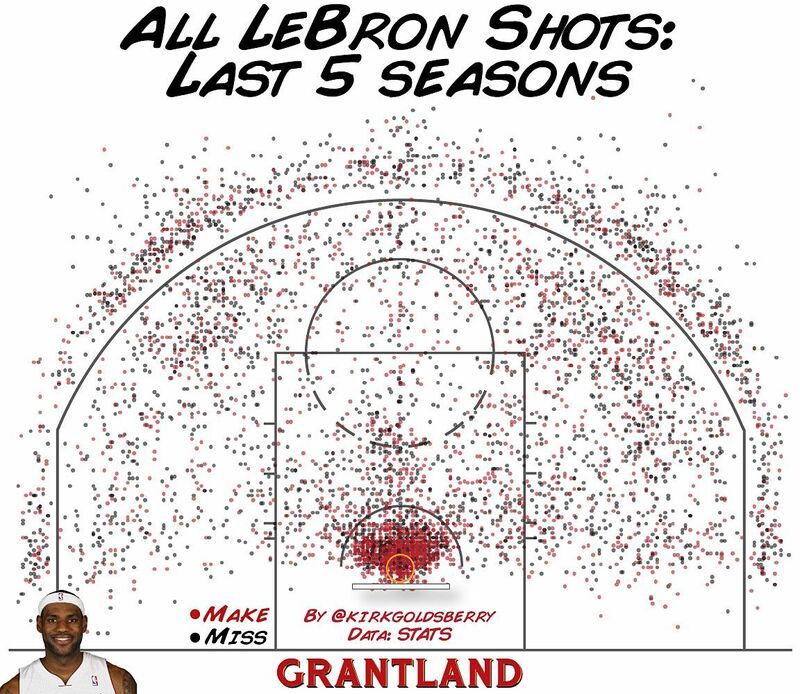 LeBron is a basketball scientist and his game is his laboratory; his ongoing research is returning brilliant results in awestruck gymnasiums from Boston to Los Angeles to London. But James is not only the NBA’s most valuable player, he is also the league’s most versatile player. We can clearly see that LeBron is great at basketball, but we’re less astute when it comes to identifying the radical shifts in his game over time. I spoke to James in Miami after the Heat beat the Detroit Pistons, their 25th consecutive win. When I asked him what he thought the biggest change in his game has been since his rookie season, he immediately honed in on his scoring. His first word says it all. Over the years, James has attempted thousands of field goals, but those shots are going in at much higher rates recently. In James’s rookie year he shot 42 percent from the field and 29 percent from beyond the arc. This year those numbers are 56 percent and 39 percent, respectively. There are two reasons for that substantial improvement in his field goal percentage: (1) He’s a much better shooter now, and (2) also a larger share of his shots are close to the basket now. James won the NBA MVP in each of his last two seasons in Cleveland. He was a great player then, but the Cavs used James as more of an on-ball point forward. Then-Cavs coach Mike Brown was often criticized for his simplistic offensive sets, which involved James handling the ball and little else. Brown — who failed to engineer an offense that optimized LeBron — was often derided as “the only coach in the NBA who could stop LeBron James.” That may be unfair, but those teams failed to win a title, and when you compare his shooting patterns in Cleveland to his patterns in Miami, there are striking differences. Some of these differences have to do with changing teammates or shifting strategies, and the maturation of the player. But, no matter how you slice it, the changes are profound. 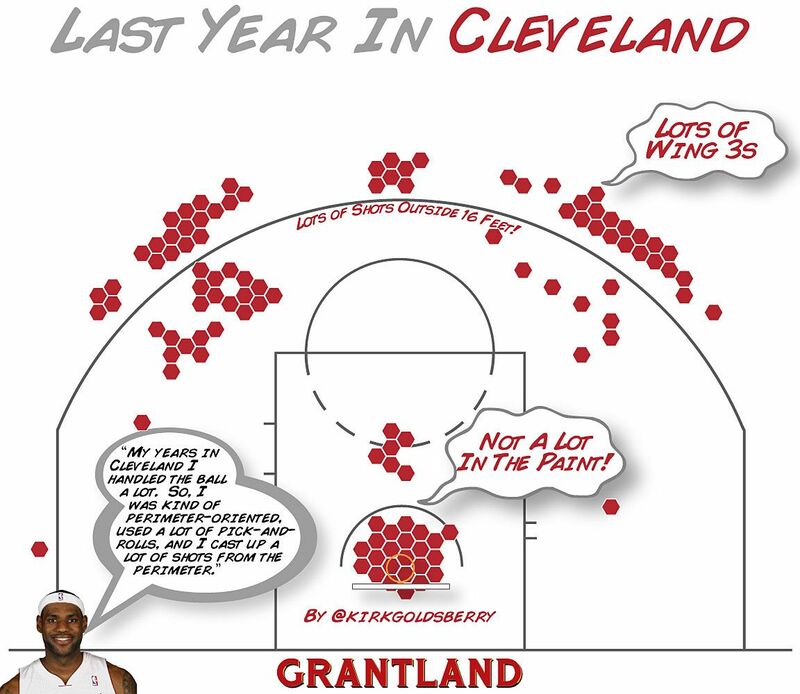 In James’s last season in Cleveland his shot chart resembles that of a point guard. His clusters of shooting activity are similar to those of Kyrie Irving or Chris Paul. James was very active in front of the basket and along both wings, where his game featured a lot of off-the-dribble 3s and long 2s. Although he shot 50 percent from the field, there was virtually no post game, and aside from a cluster at the rim, there wasn’t much activity close to the basket. He was perimeter-oriented. Lost in the hubbub of James’s signing with Miami were the strategic implications of integrating the league’s reigning MVP into an organization with different leadership, different philosophies, and superstar teammates. James was already the NBA’s Swiss Army knife — but the Cavaliers coaching staff only knew how to utilize the bottle opener. Before he landed in Miami, the Heat coaching staff was already hard at work engineering stratagems that would optimize James’s unique skill set. One thing was clear: He would handle the ball less and assume a less central role on the court. In his first year in a Heat uniform, James took fewer 3s and was much more active in the paint, but he was still spending a lot of time away from the basket. His early Miami patterns were similar to his Cleveland patterns: no hint of a post game; too many long 2s; his game was still too perimeter-oriented. And after losing the 2011 NBA Finals, James and coach Erik Spoelstra were more determined than ever to tweak their offensive approach. 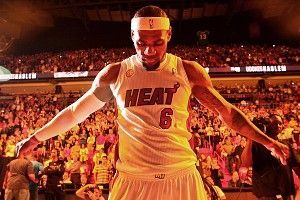 In the last game of the 2011 Finals, James was almost listlessly loitering beyond the arc, hesitating, shying away, and failing to take advantage of his freakish stature. His last shot of those Finals was symbolic: an ill-fated 25-foot jump shot from the outskirts of the right wing — his favorite 3-point shot location that season. The next morning, newspapers and blogs didn’t forget to remind us that James wasn’t a clutch player. Although few would admit to it now, countless media personalities took the opportunity to opine that LeBron James simply didn’t have “what it takes” to win championships in this league. It’s no secret where and when James first worked on his low-post game. Fueled by that loss to the Mavs, he went to Houston in the summer of 2011 to learn from a master: Hakeem Olajuwon. Translating new moves developed in offseason workouts into actual in-game NBA improvements is deceptively difficult. James knew that working on practice moves in the gym was only half the battle. 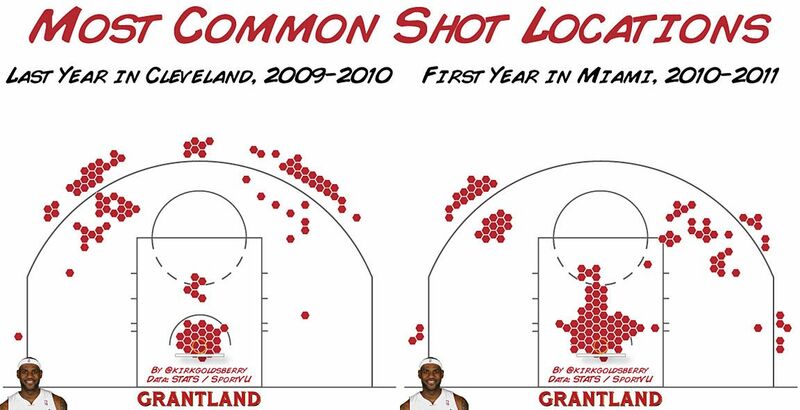 James’s shot selection in the 2011-12 campaign was completely different, and completely dominant. For the first time in his career, his game was heavily asymmetric. James spent a lot more time on the left side of the court than the right, especially down on the left block, a spot that he now refers to as his “sweet spot.” He took fewer 3s and spent most of his time closer to the basket. Good things happen for Miami when James is in the post and near the basket. Not only is he his team’s leading scorer, he’s its best passer and its best rebounder. LeBron’s migration to the left block not only helped his scoring efficiency, it opened up space elsewhere for spot-up shooters like Shane Battier. When you study his most common shot locations before and after the Hakeem trip, it’s almost like you’re looking at two different players. It’s not hard to find people around the Heat who will tell you that the summer following that Finals loss to Dallas is what transformed James from a runner-up into a champion. Up through those 2011 Finals, James had yet to fully take advantage of his size and the inherent matchup nightmares he brings to every game. Battier says James is far better at exploiting that fact now. The 2011 trip to Houston, and subsequent adjustments, obviously worked. The Heat beat the Thunder in the Finals, and LeBron was named the MVP of both the regular season and the Finals. But James wasn’t satisfied. He recommitted himself to improving even more in the summer of 2012. This season, LeBron still loves the left block, but he’s also introduced a few more tricks. This season he’s back to shooting 3s and fewer midrange shots. James told me that when he was working on his 3s, he’d punish himself until he met a lofty set of self-enforced shooting milestones. James is also a very good passer. Using optically tracked performance data from the SportVU system, we can start to visualize this vital aspect of his game. 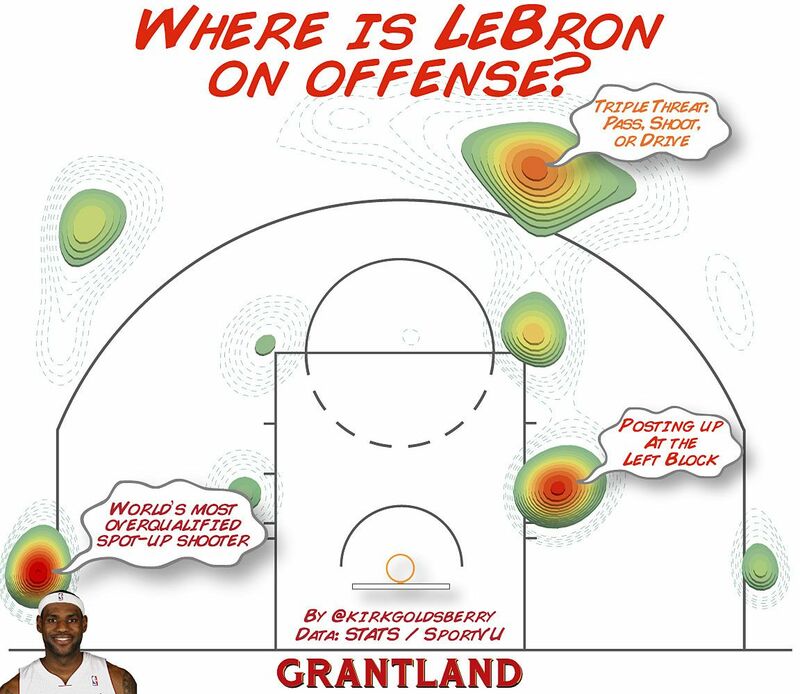 LeBron’s dominance near the basket forces defenses to collapse in upon him, which opens up shots along the perimeter. 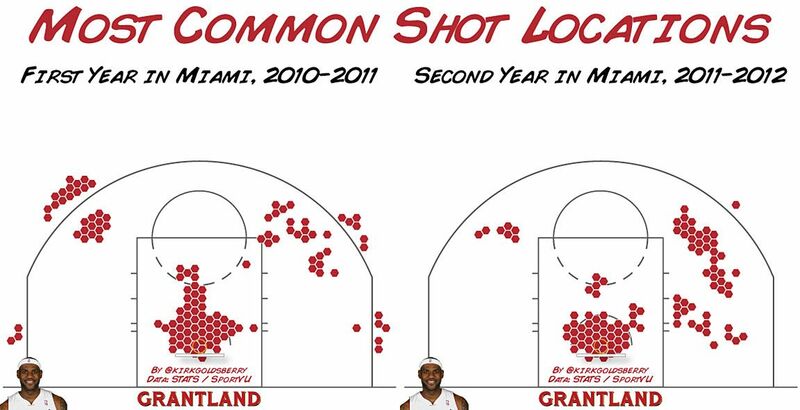 The Heat decorate the perimeter with some of the league’s most elite spot-up shooters, including Ray Allen and Battier. James is highly aware of the whereabouts of these teammates, and he’s always cognizant of who might be open where and when. As a result, he commonly fires long passes to spot-up shooters in the corners as soon as he notices a collapsing defender. The reintegration of his own 3-point shot is justified in part by James’s newfound comfort. He’s shooting 39 percent from 3-point range this season, far and away the highest such mark in his career. In Cleveland, James was frequently forced to create his own shot and rarely had good catch-and-shoot chances. That’s different now. In fact, when we look at the SportVU data to see where he spends his time on offense, there are four distinct pockets of space. Three of these areas are, unsurprisingly, on that dominant left side — on the wing beyond the arc, on the elbow, and on the block — but there’s one anomalous spot on the right. James spends a surprising amount of time in the right corner, a spot usually reserved for spot-up shooters like Battier or Rashard Lewis. LeBron says, “Our offense puts me in the right corner sometimes; in one of our sets I’m kind of in the right corner, or I’m running in transition and D-Wade is handling the ball so I’m kind of giving him space.” Although the sample remains small, James is hitting an obnoxious 53 percent of his shots from that right corner. The league’s most overqualified spot-up shooter is hitting those shots at an elite rate and providing yet another way for his team to succeed. Special thanks to Ryan Warkins at STATS for his assistance on this story.